In the Nordic countries Kafeko is representing the world leading manufacturers of packaging machines and solutions. On the Danish market our principals are Robert Bosch Packaging Technology GmbH, Statec-Binder and Mekitec. We deliver individual packaging machines and complete packaging lines for food-, bakery and dairy products as well as pharmaceutical products, techno chemical products, cosmetics, medical devices and technical components and devices. Machines for products like feeding, seeds, powder, sugar, malt, plastic granulates, chalk and a lot more products are also included in our sales program. We offer vertical baggers, Flowpack machines, Pick & Place robot solutions, cartoning machines, toploader solutions and casepackers. For vertical baggers we deliver, depending on the product, auger fillers, multi head weighers, linear weighers, counters and volumetric fillers. For horizontal flowpack machines we deliver flow regulators or buffers, feeding and grouping systems in between the process equipment and the machine. For sacks we deliver filling lines and palletizing solutions and also filling lines for “Big-Bags” are included in our scope of delivery. We integrate quality control systems like check weighers, X-Ray systems and serialization units into the lines we supply. For packaging lines and systems we also integrate third party machines and equipment. Our principals take full responsibility for the layout and the integration of these machines to a functioning packaging system. - tablets and cartoning and assembly lines for “medical device” products. We deliver packaging machines for wraparound cases, trays or tray & hood packages so called shelf ready case packages. With most of the package machines we deliver you can produce different styles of packages with the same machine. For instance with the Bosch SVE 2520 DZ VFFS-packaging machine you can produce pillow bags, bags with side gussets, block bottom bags, block bottom with corner sealing and Doy-bags with or without ZIP-reclosing. All these bags styles are produced with the same packaging machine, each bag type can also be produced with an Eurohole. We also deliver horizontal flowpack machines with an output of up to 1750 packages/minute. Heat-, cold- or ultrasonic sealing can be chosen to these HFFS-machines. We also deliver packaging machines for vacuum packages, packages with modified gas atmosphere (MAP) and if needed a degassing valve can be added to the package. We also deliver packaging machines for glass- and plastic bottles and form, fill and aseptic seal machines for cups. 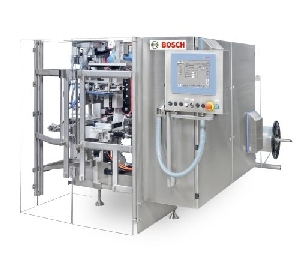 We also have packaging machines for pre-made cups and bottles for the dairy industry from Bosch Ampack. With our packaging machines we also make portion bags/sachet for dry and fluid products. Labeling machines for bags, bottles and cartons can be integrated to the packaging machines. We offer maintenance for all packaging machines we deliver. Our local engineers and the service organizations from our principals are in charge for the service and maintenance. We also offer service contracts to give our customers a good tool for planning and budgeting for service activities and service expenses.